In Little Gidding, the last poem of The Four Quartets, T.S. Eliot writes, ‘With the drawing of this Love and the voice of this Calling/We shall not cease from exploration/and the end of all our exploring/Will be to arrive where we started/And know the place for the first time’ (1942, p. 29). In line with Eliot’s affecting lines so too was it for Nick Hannaford represented in these three images that conjure memories of his life as a child with his grandfather on the remote North side of Kangaroo Island at Middle River, Snellings Beach. Aptly titled, Lines of Sight, these works reference fishing grounds and their associated lines that inform the composition of this mixed media triptych of watercolour, charcoal and pencil. South, South West Drift, 2 knots (2018) signifies a powerful memory of catching a Red Snapper with his grandfather and the knowledge passed on to him about the location of this reliable fishing ground close to the intertidal zone off Snelling Beach. 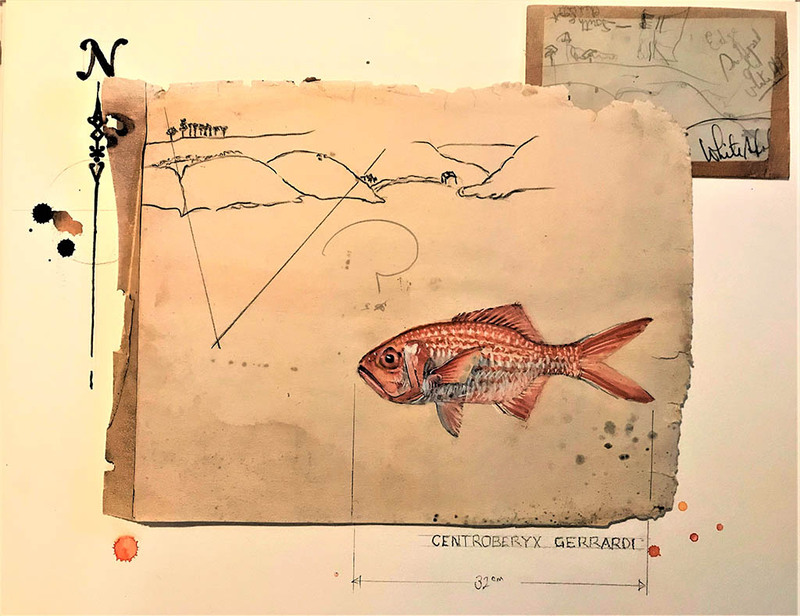 The red and silver flickers of the Red Snapper represented in this composition coupled with marks of the fishing ground harks back to the specificity of this work in reference to the landmarks, such as tree lines on Constitution Hill and the acute angle of the edge of Pebbly Beach. Memories of hauling up Red Snapper from this reliable fishing ground include the audible grumbles of Nick’s grandfather, Sir James Holden, and warbling sounds of children on the shore. Sir James Holden was a keen fisherman, inventor and manager of General Motors Holden Woodville who was knighted by Queen Elizabeth in 1963. 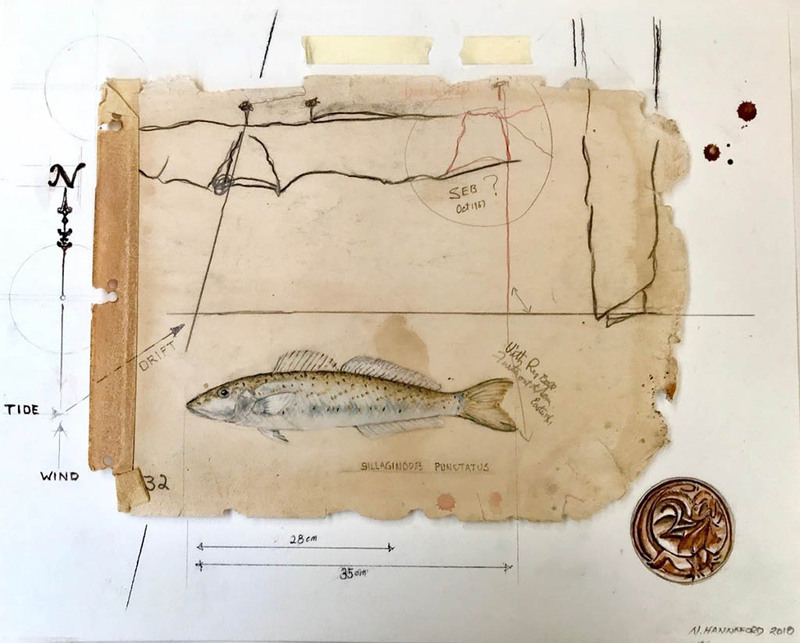 Nick’s knowledge of fishing grounds off the coast of Snelling Beach was born out of his relationship with this intimidating figure and these watercolour, pencil and charcoal images of prized fishing grounds represent a larger narrative that floats amorphously around Nick and his work. Sir James Holden used his line-of-sight from the sea to align landmarks on the coastal dune area with other prominent landmarks on the cliff tops and hills in the distance as seen in Figure 1. The point where the two lines intersect was the secret location where his fishing grounds lay. These works reveal the pages from Nick’s grandfather’s original markings and maps coupled with sketches and drawings of his own. Conjuring memories of Sir James Holden, and their days at sea when Nick was a young, the lanky bespeckled boy informs this series of work for SALA, 2018. This work is a returning to etched moments in time including standing in parallel to the ominous steel jinker and crank shaft that his grandfather invented to wrench up the heavy fibreglass boat, as well as the smell of early morning rum and a strong finger resolutely pointing out the landmarks whilst out at sea. In a similar vein to his Grandfather’s prodigiousness, Nick also underwent tutelage from his Uncle Robert Hannaford, one of Australia’s leading artists. This current series of work at SALA, 2018 signifies a shift from his earlier apprenticeship in oil paint, composition and colour theory as a 15 year old. Living in the shadows of the greats is like standing entrapped under monolithic carved sculptures of your ancestors. Following in the traditions of these seemingly mercurial figures is a momentous challenge that led to the recent shift in Nick’s works exhibited for SALA. Like the compass located in Strong Northerly, Anchor Not Holding (2018) the cardinal direction of life’s winds sent Nick away from his work on canvas to a creative world of food and special events, running pyro-technic fantasies for large companies and resort style accommodation at Life-time Private Retreats on Kangaroo Island. Whilst creativity never failed him, this new body of work represents a move away from the traditional practice in which he was apprenticed. Nick used the same principles of composition and the interplay of light as his Uncle Robert Hannaford, but mobilised them differently. Replacing thick oiled brush strokes with fine washed out strokes of water colour. His mark makings with charcoal, pen, pencil and ink on water colour paper recalls the work of his salt stained grandfather’s hand out at sea. Searching for a narrative and shifting from what Nick self-defines deprecatingly as a good copyist, he moves into an emerging representational practice realised in Strong Northerly, Anchor Not Holding. The simplicity of these intentional lines apparent in Strong Northerly is informed by his exploration of printmaking, including lino print and experimental potato stamps. This image of Sir James’ treasured whiting ground also calls into play a histiographic tradition. The elevated glass fronted frame that the works sit under, serves the viewer with the privilege of looking through the azure into a Wunderkammer; a curious collection of data that continues to elude fishing folk still in search of these grounds. These works do denote a lost archive, revived through the accurate detailing of the lines of sight despite the diminished landmarks that have disappeared over the last 40 years. Regardless, the aesthetic quality of these works is strengthened by the juxtaposition of the various elements of the tonal rendering of watercolours, the washed out torn texture of the paper and balance of line work. The triptych sections stand firmly alone but collectively they evoke analytical archival work used to describe certain species of fish. The sepia map, the archaic text and splashes of fish blood in these works act as a palimpsest over the memories of propriety embedded in these journeys where Nick was not only taught to catch fish, know where to catch them, but also required to pronounce the words “How Now Brown Cow” from his chest, rather than from his nose. There were layers of induction into the world which Sir James occupied far from these secret grounds. In this final image, Dodge tide, should have stayed in bed (2018) there is an absence of fish on the sepia-toned, rust marked drawing. Instead, the fish remain uncaught under the sea moving with the tides strategically located in the background. The Phases of the Moon are marked on the compass signifying a dodge tide – when the fish do not bite. The fish represented in this work have an intaglio quality. The line work outlining the fishing grounds moves from foreground to background, but creates a seamless connection in this collage of mixed-media work, including a hint of Sir James’ favourite Green and Gold recipe. Colour scoping was reduced to sepias furthering a sense of reduction that helps build a narrative through harmonising these various mediums into a complex text. This final work, Dodge tide, should have stayed in bed (2018) clearly is breaking traditions and informs a new representational field that brings in the new whilst paying homage to the old. This shift in Nick Hannaford’s work selected for the KI Cliff Tops + Coastal Dunes exhibition at SALA at the National Wine Centre reveals an interesting narrative, drawing out significant historical figures that in many ways highlight their contributions to South Australian history. 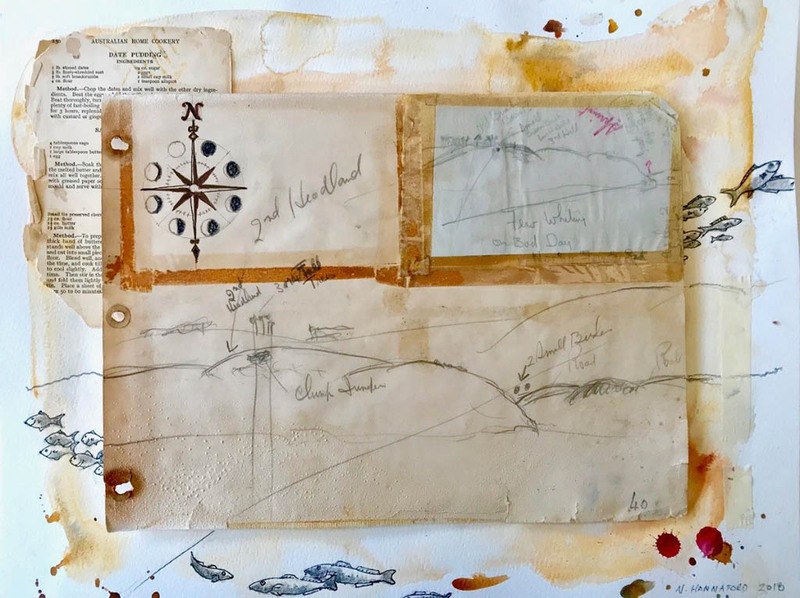 These works are a libation to an ancestor and an illustration of memory coded fishing grounds embodied as a result of a deep and respectful relationship. After spending months conjuring his dead grandfather into a collaboration, these works stretched the paintbrush back in time aligning Nick and Sir James together – returning them back to the place they began, and as in the lines of Little Gidding, ‘knowing the place for the first time’ drawing and fishing out at sea. D’Avezac, M. (1874). Aperçus historiques sur la rose des vents: lettre à Monsieur Henri Narducci. Civelli: Rome. Elliot, TS. (1942). Little Gidding. The Four Quartets. Faber & Faber: London. This highly-anticipated exhibition of Kangaroo Island inspired artworks will leave you breathless! More than 120 exquisite pieces representing a variety of mediums and representing exhibition theme Kangaroo Island Cliff Tops & Coastal Dunes is open each day from August 3 – 26. View Artworks by Audrey Harnett, Caroline Taylor, Cecilia Gunnarsson, Deborah Sleeman, Diana Keir, Fred Peters, Janet Ayliffe, Jenny Clapson, Kenita Williamson, Llewelyn Ash, Maggie Welz, Michele Lane, Mishka Ammann, Nick Hannaford, Nicholas Burness Pike, Patti Blucher, Peggy Rismiller, and Quentin Chester. The exhibition features a wonderful array of brand new art jewellery pieces. First Stop Kangaroo Island Easter Art Exhibition! 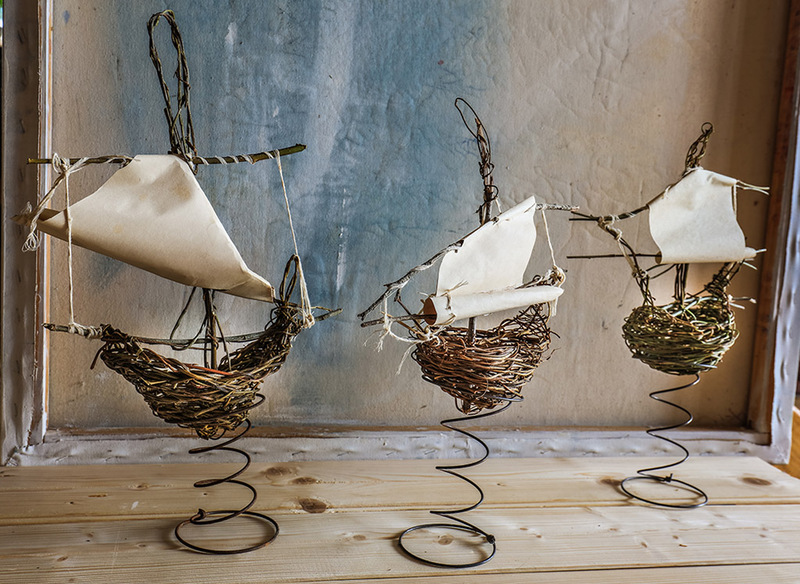 Diana Keir sculpture “I Saw Three Ships” from the 2016 Easter exhibition. Whether you’re visiting KI for the Easter long-weekend, or just another island ‘local’ lamenting the fact that you and your family “don’t get out much”, there’s no better way to spend Easter 2018 than following the Kangaroo Island Art Trail! The island’s biggest Arts event, the Kangaroo Island Easter Art Exhibition is back this year to kick things off in a big way, but it’s definitely just the first in a long list of places and events where you can immerse yourself in the beauty, diversity and creativity of the local arts community. Kangaroo Island Easter Art Exhibition Back in 2018! Opening Night, March 30, 2018. Visit daily between 9am and 5:30pm (see variations below). Kangaroo Island’s artists make a huge contribution to our community every year. Just spend some time traveling around the island and you’ll see the mark of our vibrant arts community all around you. From eye-catching public sculptures to the artworks on sale in coffee shops, at cellar door restaurants, and some of the island’s best-loved festivals and events, art is a constant. 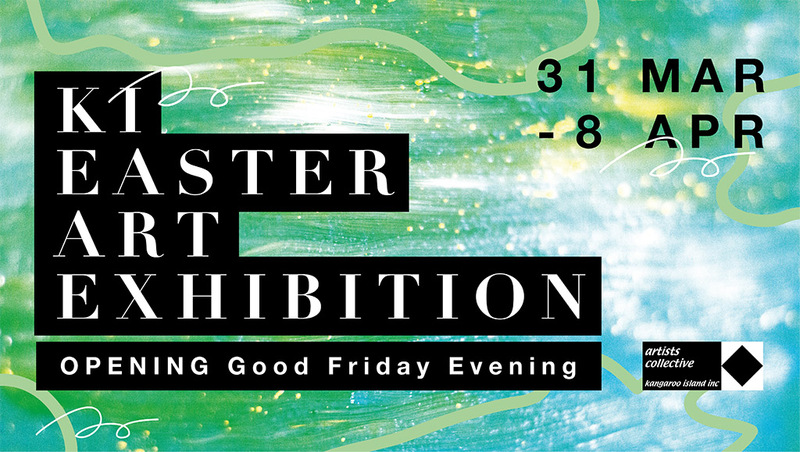 [Read more…] about Kangaroo Island Easter Art Exhibition Back in 2018! 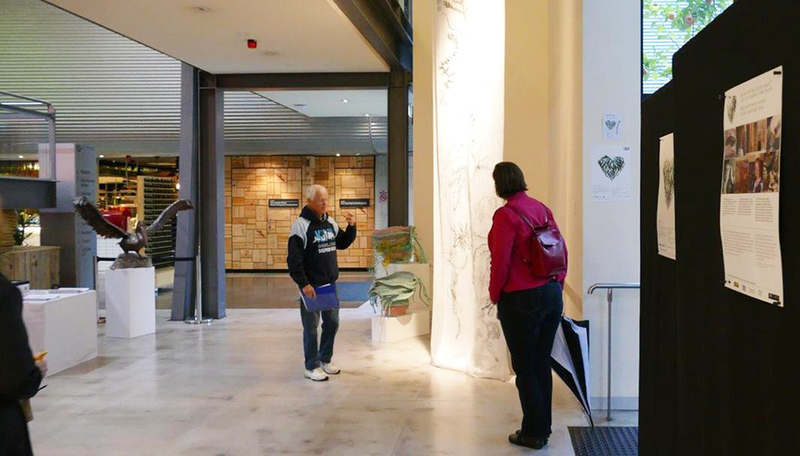 Still time to find a piece of stunning Kangaroo Island inspired art – but hurry! KI is a unique arts destination and beloved home to hundreds of creative souls. 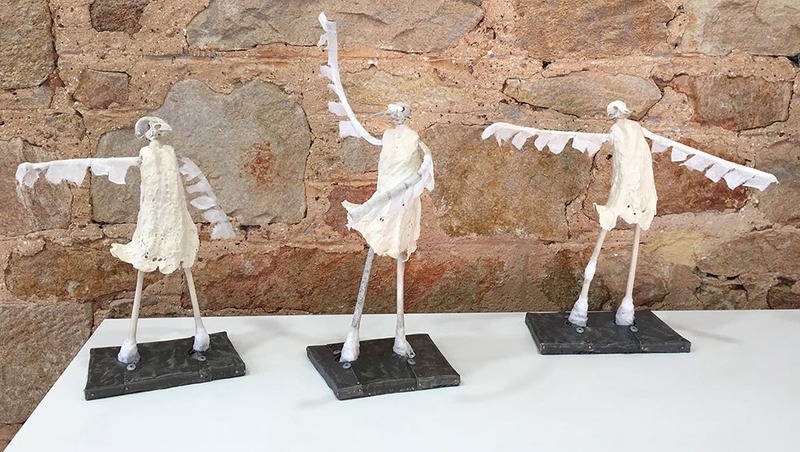 With a long tradition of captivating artists, the island’s uniquely evolved habitats and surviving species have again provided a wellspring of inspiration for those shortlisted to exhibit in the annual SALA exhibition at Adelaide’s National Wine Centre.